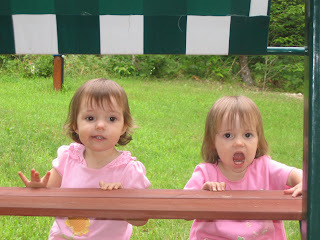 I've bitched and moaned waxed poetic about some of the trials and tribulations of having twins. In the beginning, I spent a good portion of my days crying. Drew was 2 years and two weeks old when the twins were born and Megan was in kindergarten, just two weeks shy of her 6th birthday. We had only been in our new house for a few months. It was totally chaotic and overwhelming. I spent my days nursing, changing diapers and trying to get a free moment to love and hug my other kids. Combine all that with trying to still be a good wife and I was a general mess. Now I'm not saying that I've gotten it all figured out, but one thing has changed. I don't spend as much time crying (at least not every single day). The demands from the kids, especially the twins, are different now. I have routines that we follow pretty consistently. As with everything in life, there are speed bumps but I'm less sleep deprived and more caffeinated and I can navigate them much better. Annie and Izzie are in a really fun, but sometimes insane, place. They'll be 2 in January. They spend a lot of their day trying to figure out what they can and can't do. Climb on the kitchen table to get the napkins? No, Mama doesn't like that. Run across the furniture? No, Mama doesn't like that. Not nap? No, Mama REALLY doesn't like that. But what Mama is loving is how they interact with each other. They are both very nurturing. If Annie is sad, Izzie will get Annie's blanket and puppy and bring them to her. If Izzie drops a toy, Annie will (for the most part) give it back to her. They are constantly signing "thank you" to each other. They will don purses, say "goodbye Mama" and run around the kitchen table to shop. They will sit side by side and read books. They'll give their older siblings hugs and kisses. They love to brush their teeth, have their hair combed and take baths. Distance does make the heart grow fonder. Now that we're out of the nursing/constant-diaper-changes/crying-all-day-long phase, I can look back on that time with some fondness. They're no longer babies, but they'll always be my babies. I think there is something special about twins. It must be nice for them (and you) to have a playmate. 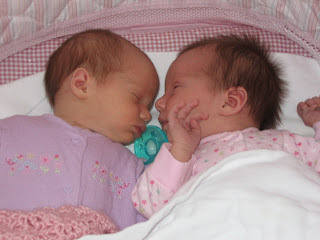 What precious little girls!! The picture of them when they were babies? Melted my heart into a squishy puddle.